Backup all your data from virtual machines running on ESXi host and vCenter server to the BMR server securely and retrieve them during any data loss. Store entire data of hard disks including the operating system (OS) and application configurations in an onsite server and retrieve them in case of catastrophic failure. 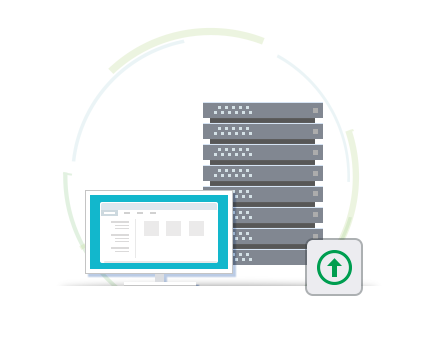 In addition to local backup, IDrive offers cloud replication which allows you to transfer backups stored on your server to your cloud account for a better disaster recovery plan. Also, maintain a ready-to-use, bare metal restore (BMR) capability with each image-based backup. Encryption-based ransomware is getting sophisticated and may not be detected by anti-malware software in time. Once infected, you will be locked out from your own data and there is still no guarantee you can retrieve your data even after paying the ransom! Take advantage of IDrive BMR's snapshot backup — a robust backup solution, allowing you to restore the copy of data prior to infection. IDrive BMR uses AES-256 CCM encryption to secure your data on the local BMR device as well as on the IDrive cloud. Your data is encrypted even during transfer to the cloud. Backup multiple partitions or whole hard drives; creating recovery points for your entire system. Select full or incremental backup for more efficient backups. Ensure support for your VMware machines with backup and recovery of virtual machines, cloud replication and instant virtualization via a centralised web console. Enable quick incremental backups with BMR’s own Changed Block Tracking (CBT) driver that identifies the blocks of data that have changed instead of comparing and backing up every block. There is no need to download any application to connect to your virtual machines. Use BMR’s web-based client to instantly connect to your VMs. Save time with BMR’s efficient backup plan. In addition to image backup, use the available cloud space to secure Linux, Macs, PCs and Mobile devices. Use Snapshot-based image restore for point-in-time recovery. Restore multiple machines in one go as image data can be accessed directly from the server during restore. Restore data from the server to your machine using nothing more than a pre-configured boot CD or USB drive. You also have the option to restore individual files through the web console. Perform bare-metal restore using a recovery environment based on WinRE that supports a variety of dissimilar hardware and includes built-in Windows repair tools to resolve OS boot issues. Create up to four virtual instances of your clients on the BMR server instantly using the KVM hypervisor, which provides a better virtualization infrastructure and lets you resume business during data loss. IDrive BMR machine is a high powered server grade device. With the capability to backup hundreds of machines, it's an ideal solution of Disaster Recovery as a Service (DRaaS). Restore individual files / folders from VMware backed up data on BMR, irrespective of the VMs' OS type. All major file systems are supported by BMR. Transfer backups stored on your IDrive BMR server to your cloud account, and set up a safer disaster recovery plan. Schedule cloud replication and monitor the backup status through the centralized console. Transfer several terabytes of data to your cloud account with zero bandwidth consumption, via physical shipment of external storage device. 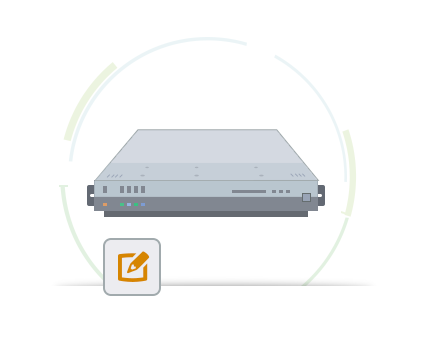 Manage your local BMR appliance from anywhere, without the need of being on the same network as the BMR Server. IDrive BMR encrypts your data at rest, and during transfer to the cloud account. Therefore, ensure that your data is always secure with BMR’s cloud backup. Create a customizable data set that includes computers or VMs, and manage the replication schedule (days, start time, stop time etc.) easily from the web console. Incremental backups are always initiated; thereby, helping you save bandwidth and storage space, for more efficient cloud replication. Monitor backup status and activities remotely through a centralized web console. View comprehensive statistics and logging options to monitor backup status. Machines are auto-detected by the server, once the agent is installed. No other configuration is necessary on the client side. Admin can manage the client from the centralized web console. BMR server runs data integrity check after each volume of client machine is backed up, to ensure backup reliability. Status of the integrity check is sent as email notification. The non-intrusive agent runs silently in the background while processing image backups. Admins can apply settings using the tools provided in the IDrive BMR Server without any modification to client machines. IDrive BMR uses advanced block-level de−duplication and compression for optimized storage capabilities. The BMR server is built with an Enterprise-grade processor that includes a higher-capacity RAM and powerful hardware components for secure data backup and virtualization. Sign up and get IDrive BMR device shipped to your address. Download the agent and run it on the system you want to backup. Access IDrive BMR server to manage backups, review statistics, etc. Please provide your information and our sales executive will contact shortly. Thank you for contacting us. Our sales staff will get in touch with you shortly. * This feature is available with IDrive® BMR version 7.0.0 and above. Note: You can backup dynamic or logical volumes in MBR disk. However, Bare-Metal Restore of these volumes is not supported. You can still recover data from these backed up volumes by using the 'File Restore' option. Refer steps to recover backed up data using file restore option.